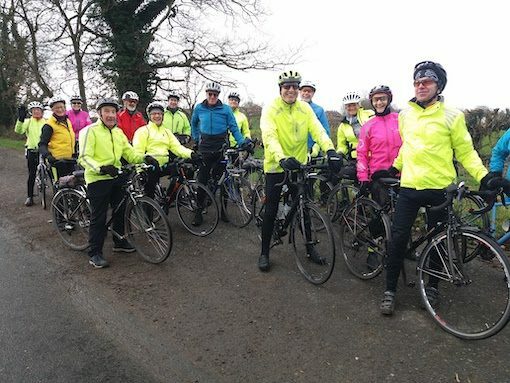 A mild February morning saw a good turnout of Wanderers for a ride to Boroughbridge via Ripon and Skelton. Fourteen set off for Knaresborough where we picked up Steve at Low Bridge. A gentle SW breeze helped push us along towards Burton Leonard where we all managed to safely circumnavigate an articulated lorry wedged at the minor road junction. The driver obviously didn’t heed the warning sign ‘Unsuitable for HGV’s’. At Bishop Monkton, Karen and Judy decided to head for home with Dennis’s guidance. The remaining dozen made good time to Langthorpe and welcome refreshments at Listers farm shop. There a decision was made to extend the route by returning via Roecliffe. The Leavers Steve and Barbara kept to the designated route and headed off in the direction of Minskip and K’boro hill. The Remainers took the easier option of Copgrove bridleway, Burton Leonard, Nidd and Ripley. A dozen members opted for the Wednesday Ride today. The usual route out of town to Beckwithshaw and Little Armscliffe was accomplished in short order. On meeting the Otley Road it was left then right onto the spectacular Jack Hill Lane where we stopped high above the Washburn valley for a photo with Swinsty and Fewston reservoirs in the background, (I’m ignoring Menwith Hill) and deep in the valley below the curiously named 18th Century house Buryemwick “Bury them alive”. Sword Point is nearby so perhaps some gruesome goings on took place around these parts? The ride was far from gruesome. Onward through Norwood Bottom, Lindley and Leathley – it was a joy to be out on a bright February day in good company and with only a few strong gusts to contend with. This must be one of the most picturesque Wheel-easy routes I have ridden. Refreshments were taken at The Local Pantry Shop and Café on the A658 near Pool. My first visit and the friendly staff get full marks from me. From here we returned to Harrogate via Castley, but before Almscliffe Crag three riders had already split and the remainder split two ways at Briscoe Rigg, taking their preferred route home. 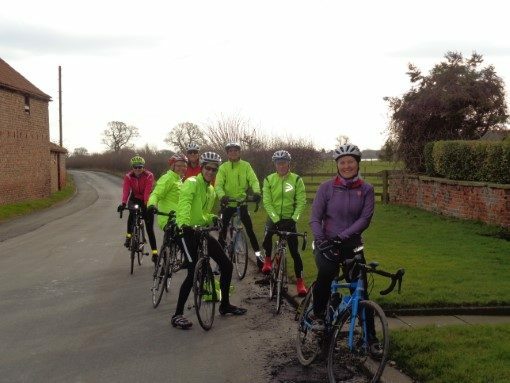 After last week’s endurance test in the cold and the hills, this week’s long ride opted for a flat ride to Haxby, near York. Why Haxby, you may say. As usual it was the cafe that lured us – bursting with friendly staff and Fair Trade stuff, the Aroma Coffee House is an excellent friendly venue, an offshoot of the Methodist Church in the village, but in a proper high street retail unit rather than a church hall. Coffee, cakes, lunch menu – all good. Six riders accepted the lure and set off from Hornbeam to collect three more at Piccadilly Motors. Out through Arkndale and Gt Ouseburn to Aldwark Bridge, we could still feel the morning chill but the breeze was helpful and the sun kept us cheerful. Steady and incident-free riding got us to Haxby at 11:30 for an early lunch, where Panini were popular. Convivial surroundings at Aroma Coffee Shop kept us at our tables for almost an hour, chewing some familiar topics – in our case the quality of political leadership locally and nationally. Richard P left us to continue into York for a look at an exhibition, while the rest of us made our way back along a figure-of-eight route via Beningbrough, Aldwark Bridge again and Whixley. En route to Thorpe Underwood we came across the cyclist’s curse of newly-cut hawthorn hedges and picked our way gingerly through the debris as best we could. Once at Whixley, we chose a different way through the village to cross A59 further west than usual and continued on to a narrow lane leading to a “stop look and listen” level crossing, which required the negotiation of a pair of kissing gates. All of which added to the variety of the day: for several members of the group this lane and crossing were a first time along a previously unknown route. The surface deteriorated somewhat past a farm and this drew adverse comment from some but soon this was behind us as we emerged on to A168 for a time trial burst to Walshford and the Bridge Hotel. Exposed to the southerly breeze we felt its effect along these main road sections. But soon, we had arrived at the parting of the ways between North Deighton and Little Ribston, where four headed for Knaresborough and the rest for Spofforth. In Spofforth the hawthorn curse struck home, with Graham being the unlucky party. It’s difficult to point specifically at the earlier hedge trimming, given the miles since we left there, but a sizeable hawthorn spike it certainly was. Gathered outside a property in Church Hill the resident came out to offer help – always nice, but even nicer was the fact that he is a fellow triathlete in the same club as Richard Leake and had ridden with Wheel Easy in the past. I do like observations of the human condition through popular culture and a wild west theme emerged (for me) during the day but more of that later. Let’s start at low bridge where a good crowd of 11 old blokes gathered (imagine Yul Brynner holds up eleven fingers and smiles knowingly). The forecast was positive with temperatures on the rise but the morning was overcast with a fresh breeze from the SW. Messages were exchanged with Whixley Graham who was going to meet us at Tancred Farm. I think the idea was for the A and B to go by different routes to arrive at the same time but that evaporated and as far as I know we used the same route. 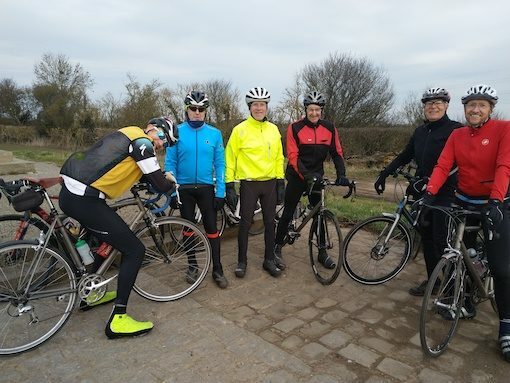 We collected Dave W (now 12) at the end of the riverside path and as the A and B team merged and split, the A team (now eight, keep up Yul) headed off on a wind assisted ride to Tancred through Little Ribston, Cowthorpe, Cattal and Whixley where Graham was waiting (nine). The feeling of riding in warmer temperatures with the wind on our backs I find hard to describe, a delight to feel the legs going round! I dropped my chain on the climb to Whixley. I made the necessary adjustments and went for a test ride and met the B team (13 in total and it wasn’t unlucky) . As ever the discussion covered a wide range including, stereotypes, crosswords (the puzzles not getting upset with each other) and even where next. A plan was made, off to York then call in at Askham Niceley for a stop. Graham and Dave W arranged to split off, not sure where Graham was going and Dave had to be back for 3.00pm. We A team (now nine: Dave W, Dave P2, Geoff, Marvin, Phil, Pete, Eric, Graham and me) followed a familiar route over the bridge at Aldwark were the man who doesn’t moan if you don’t put your foot on the floor greeted us, Graham left us before Beningbrough Hall, then along the cycle lane by the river where we were asked to dismount to go over a bridge being refurbished. Why do I find that hard to do and insist on scooting across, which they were happy with as it kept their tarmac pristine, we thanked them for their good work. Dave W left us at the ring road for a more direct route home and declined offers of company. And we were seven, Yul would be happy! The new bridge in York is under construction and impassable for those going that way. Apart from keeping an eye on the joggers the only other event of note was a communal comfort break. The sun had come out to make cycling truly wonderful even though we were riding beside the A64 it felt good. It was warm enough for three of us to eat outside at Askham Richard. 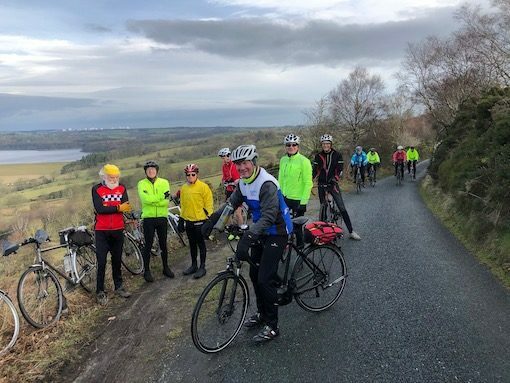 The reason I volunteered to write this report is because I want to convey what an amazing feeling it was to be out on my bike with a bunch of like minded souls. On the way back through Tockwith (picture at Marston Moor) I felt as if my chain had broken, but in a good way, it was easy to pedal. Setting a pace that was brisk enough for all, pointing out holes I wish I could bottle the feeling when everything feels just right. Pete turned north towards Cattal but as we approached the Knaresborough Wetherby road Dave P2 punctured but we didn’t hear his shout. We waited then I went back to find him 400m down the road in the process of changing the tube. We did the usual ME: I’ll help, HIM: No it’s fine go on, ME: No I’ll stop anyway. Then something lovely happened (Like in the big country when the mad boss of the ranch rides into the canyon to face certain death then his right hand man and then the rest of his cowboys join him out of loyalty) A silhouette appeared on the brow of the hill then another and another and the rest of the several arrived. Marvin provided CO2, I found the thorn before the new tube was punctured, Phil removed said thorn and with Eric helped replace the tyre, Geoff folded up the old one. It felt as if the puncture was a good thing as we shared advice and thoughts on rolling resistance. I can’t believe this! I found out some people do not count the pumps they put into their tyres/tubes and don’t have a lucky or unlucky number to finish on. We had a fair number of riders at Low Bridge, well over a dozen at least. First action to choose the first coffee stop, Tancred Farm Cafe said Eric, all in agreement, now that was easy. A quick text to the Whixley Wheeler to join us there and away we all went. The “B” team comprising Bill W, Dave P, Nick and Norman (not a double act) wented a little slower. On to Walshford and the very minor road to Whixley, crossing the rail crossing and the A59, was in good condition and for once, the A59 was traffic free. Nick had a previous engagement so left us before the cafe. Then it was in to the cafe to test the toasted teacakes. Away went the “A” to head somewhere York-ish. Sometime later the “B” team headed for Boroughbridge via the Dunsforths. When in Dunsforth land Norman asked one of those totally unnecessary questions ie did we want a coffee stop in Boroughbridge? The answer was never in any doubt and a comparison of the toasted teacakes was made in Morrisions . One EG wished to get some practice in for the York Rally Sportive in April. So after joining the rest of the Group at Tancred Farm, rode with the ‘A – Team’ as far as Shipton. They then turned south.